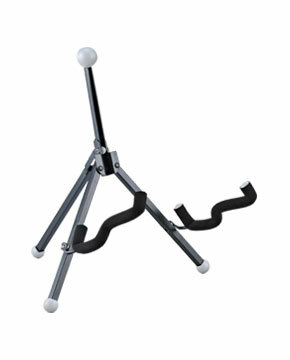 The Stage PRO KB3500G Super Guitar Stand has three legs and a hinged back support which allows it to fold to a small size for transport and storage, easily fitting into most any gig bag. The back support cushion is a larger spherical shape and made from a soft rubber. This material is safe for all types of finishes and has an attractive look. The feet are made from the same thermoplastic rubber as the back cushion and are also spherically shaped. All metal parts of the stand are finished with a durable black powder coating. In function the back support arm and cushion rotate up for use, providing a higher support position than what is offered on other brands of compact folding stands. The three legs are made from steel tubing, which provides more stability and is lighter in weight than stands made from flat strips. Additionally, there are no knobs required for adjustment. One stand does it all. The KB3500G Super Guitar stand's folding cradle support will work with a wide variety of acoustic and electric guitars and basses. For the retailers, there are fewer products to stock. For the musician, there's no need to worry about having the right stand for the instrument. Provided in a self-merchandising display box with a great deal, the KB3500G Super Guitar Stand from Hamilton is a perfect choice for the store, home, travel and studio!